This week’s restaurant: Fong Noodle, 1515 N. Mountain Ave. (at 6th), Ontario. 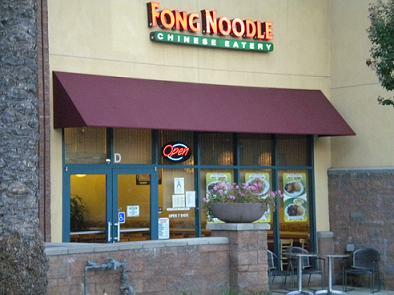 I’m sure I would never have tried Fong Noodle, a small Chinese restaurant outside the Edwards 14 theater off the 10 Freeway, if not for a tip from reader Stephanie Ulmer. Ulmer said prior to Fong’s arrival, it was typical buffet-style Chinese. Now they cook your food fresh when you order it. She and her friends love it. Curious, I gave Fong Noodle a try Wednesday evening. The menu has Americanized Chinese stuff like broccoli beef and the ubiquitous orange chicken, but also boasts chow fun (broad flat noodles) and Singapore-style noodles (thin, spicy), both of which are relatively rare in these parts. I ordered shrimp chow fun ($6.95). The order was passed from the middle-aged woman to the middle-aged cook, who sprung into action. A simple salad was brought out, followed several minutes later by a large plate of noodles, plus an egg roll. The noodles were fresh, the shrimp plentiful and the portion enormous; I took home half. They make their own noodles, the counter-woman confirmed. How about that! The storefront location is sparkling clean, the decor understated: paper lanterns, a decorated fan and two pieces of traditional art. There are two outdoor tables and plenty of inside seating. And, that evening, plenty of empty seats. Thanks for divulging your secret. Yay! So glad you made the trip over to Ontario! And it is also great news that you liked the food. Funny, we have never ordered noodles — we always get the chicken with asparagus and sometimes sweet and sour chicken — traditionalists, I guess. Thanks again for the shout-out. I am happy to do my part in recognizing good food when I find it! I tried the place Friday evening on your recommendation. The food was pretty good, but the service was a bit slow. One cook staffed the kitchen, and he appeared to work feverishly. Not sure why it took so long to get my dish, though. Hardly anyone else was there. Ate there last Saturday on your recommendation (before seeing “Up,” a great movie). Shrimp Chow Fun was delicious, generous with the shrimp and a great value. As per Rod L., it wasn’t exactly fast food, but I couldn’t argue with the amazing results. Ate there yesterday, enjoyed my beef/asparagus but found it too salty. Next time will ask for them to hold back the sodium. Service was a little slow but being retired I am usually in no rush to get anywhere so it didn’t bother me. I did eat at Dolce Bakery in Montclair earlier in the week and there was only one other party there, a family of three. The service was very slow and my food was good but took forever to get to me.